It seems as if to actually gain something of intellectual value from a book one has to go beyond the basic reading of the work. The reader must look at syntax, theme, moods and symbolism to get to the true meaning the author was trying to convey. After all these years that I have been out of school I have fallen back into the old habit of just reading books for the enjoyment of reading, but as I approach this project I have realized that I must get myself back into the habit of reading analytically. In order to get back in the habit I understood that I needed a refresher course on analytical reading.. here in lies the problem. 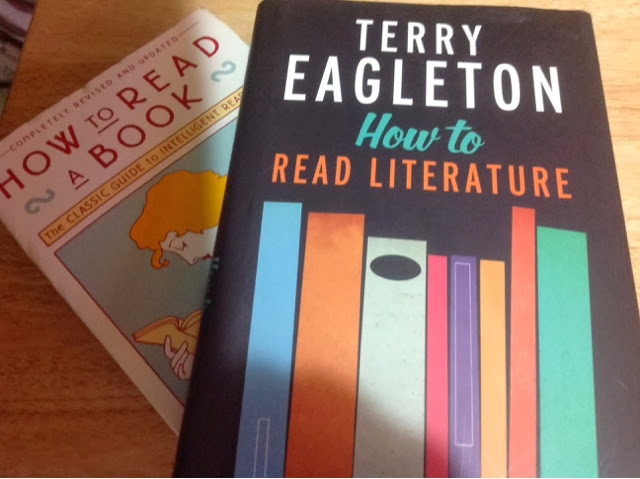 Perusing Amazon.com it seems there are many literary heavyweights who want to teach us how to read a book; Mortimer Adler, Harold Bloom, Terry Eagleton and Thomas C. foster to name a few. The Great Courses even offer a series on The Art Of Reading conducted by Professor Timothy Spurgin on how to go beyond just reading a book. The question we have to ask ourselves is how do we go beyond our just reading for enjoyment to reading books to take something more from them. Yes some authors are just trying to tell a good story, but other books, they are trying to teach us something more; maybe it is something about the human condition,maybe it is something we are really afraid to deal with on an emotional level, it may even be something on a sociopolitial level that we aren't really grasping when we watch the news. Ultimately we have to go beyond the narrative to see what an author is truly trying to get at. I guess I'll have to see what these books and lecture hold in order to help in really getting beyond the narrative itself.